Oakland Urban Paths (OUP) is a group of dedicated walkers, planners, historians and fundraisers with a common mission: to raise awareness of the paths and Oakland’s heritage through a variety of activities in partnership with Walk Oakland Bike Oakland (WOBO) and the City of Oakland. We encourage people to explore Oakland on foot! The group was founded by Paul Rosenbloom and Dan Schulman. A special shout-out to Charlie Lenk, who regularly helps with walks, shepherding people, carrying the speaker, taking photos, and whatever else needs to be done. Are you interested in volunteering? Ideas for a walk? Let us know! Paul, thanks for the lovely 2pm walk today, the one thru the Rose Garden. Here’s how I was notified of Jane’s Walks: info was sent to me from Julie@newvillagepress.net re: May 2010 Newsletter. Your map does not show the path in Crocker Highlands that connects Longridge and Sunnyhills Roads between Grosvenor and Carlston. Condition is fair and path is used. I try to do a rake and blow every couple of weeks. Thanks for the info…and the regular cleanup! We’ll make sure that this path gets included on future maps. You were featured on KPIX’s EYE ON THE BAY show 2/14. Do you have a map of Oakland paths? Local bookstores like Pegasus, Black Oak, Walden Pond and Builder’s Booksource carry the Walk Oakland! Map. It’s also in some local bike shops. Call and ask before you make the trip. We also sell copies of the map for $5 on our walks. I’ve known about the stairways and walkways for years and have used a few in my neighborhood of Glenview. Now that I’m walking more I’m starting to explore the stairways–I’m hooked! Glad to find your website. See you soon on a walk. Your invitations say “dogs welcome” but does not say that dogs must be on leash. I would think this would be a pretty much automatic requirement, but maybe I’m wrong. Please clarify. Thanks. Correct. In part because we are regularly walking next to or crossing busy streets, dogs need to be on leash for their safety if nothing else. There is a rumor going around that Dennis Evanosky will be leading a tour of the Hayward Fault and the Wilshire Heights landslide area. What date would this be? Dennis will lead in November, 11/10. I looked out my front window this morning and watched a big group of walkers cross 35th at Willis Ct. Someone in the group was wearing a shirt printed with the words OAKLAND URBAN PATHS, so I visited your website. What a great idea! I would love to join in on your next walk. I notice that your Jan 11th Borax SMith walk will go past an interesting and perhaps not noticed path. When you leave the Cascade, your map shows going up Merritt and down Capital. I plan to meet you at the Cascade and point out where Cleveland street would have been and now isn’t. And later as you go down Capital, I will show you the other end of the street. Is there any 501(c) organization who repairs these paths? There are several in Oakland needing some work, and I’d like to volunteer to help rebuild them. I found a narrow paved path between Church Street and 69th Avenue at the end of Avenal Avenue. It runs past the Church Street Market. Neither your map nor Google Maps shows it. 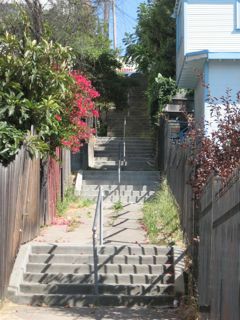 Can someone please tell me who within the City of Oakland bureaucracy has oversight over city paths? Where can I find a key to the numbered paths shown on the map PDF? What is the cost of a walk? The walks are free. We do accept donations (for things like the sound system). The Cleveland Cascades, Haddon Hills and Ivy Hills walk was fantastic! Can’t wait for the March 2016 walk. In the late 40’s early 50’s a group of us would take the key system from SF to Lake Temescal. That was a long time ago I know. Can you tell me how we got from the station to the Lake? Would it have been a long walk. Thanks so much for your time. One possibility is the Sacramento Northern Railway. It was an electric railway which ran from Oakland to Sacramento all the way up to Chico. In Oakland, its tracks started at 40th and Shafter (it used Key System right-of-way below that), ran up Shafter through Rockridge, and past Lake Temescal. (After that it ran behind Montclair Village, up Shepherd Canyon, and through a tunnel out to the Contra Costa County side). See https://oaklandwiki.org/Sacramento_Northern_Railway for more info. Looks like you have a great group of walkers. Are you aware of any “non-published” pathways around the Redwood Heights Elementary school? We’re researching safe ways to walk to school in the fall and with so many dead end streets or very busy traffic streets, we’ll have a hard time to enjoy a walk to school (rather than drive). The neighborhood we’re in is Fair Ave. and Carson. On a similar but different topic, are you aware of any effort to carve out a small park near the 39th Avenue reservoir? With the renovation set to begin in 2018 ish seems like some of that beautiful grove of trees should become a neighborhood pocket park. Where is schedule for future walks? Can anyone point me to a list of the paths names that correspond to the numbers of the paths on the Pedestrian Paths Map, available on the oaklandurbanpaths home page? I want to sign up for March 18 OUP walk but will not be able to join walk until 10;30 AM. Could you please email me a map of walk and an approximate location of walk at 10:30 AM? Thank you for responding to my request. I’d like to share some photos with the site. How do I do it? I was just wandered if you know that a Berkeley / Oakland designated PATH – the SHORT CUT that runs from Tunnel Road to and from Alvarado is threatened by the proposal to build a 43 condominium complex on it ??? ?